Yesterday i had one of the biggest shocks of my life. A package arrived for me around 6.30pm and i was like, what you can get packages this late in the evening?! Anyways, it had my name on it and it was from America. Now, i hadn't ordered anything recently so i had no idea what it could have been. So i then opened the Sacks Fifth Avenue box to reveal a bubble wrapped MICHAEL KORS box :O!!! I've wanted a Michael Kors watch for the longest time but i never found one that i instantly fell in love with and actually wanted. The past few months i'd been searching the internet for one and i came across this particular one. I'm quite a picky person so when i like something you'll know and i'll have my eye on it until i finally get it haha. So, i added it to my 'Wish List #1' post thinking nothing of it because you can't get this particular watch in the UK. Apparently, my Dad had seen it on my blog, i'm guessing through my Mum a few weeks ago. He was searching the internet for hours, he rang up Westfield, Bicester Village everywhere he could think of but they all told him the same thing i knew, you can't get hold of it in the UK. So, he moved onto the internet and came across Sacks Fifth Avenue, he rang them up and they had one shipped out straight away to us. I still can't believe it, i wasn't expecting anything haha. I went to go get the straps adjusted today so now it fits my wrist perfectly :D can't wait to post an OOTD with it for you all!! If my Dad wasn't sweet enough, on his way home from an all day business meeting yesterday he stopped off at Bicester Village for me and picked me up some goodies from the Cosmetic Company Outlet (CCO) so be sure to keep your eyes peeled for that, he picked everything himself for me, love him so much!! What an amazing surprise!! we have both had lovely surprises this week haha! But seriously your parents are so sweet, and this watch is so stunning!! 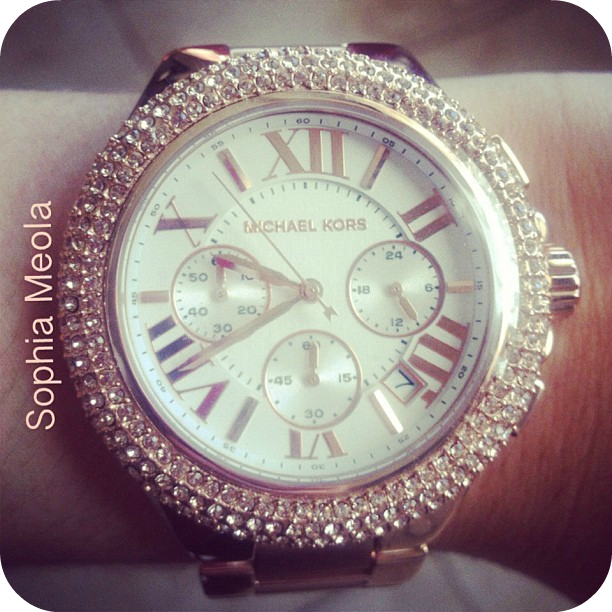 Wow you lucky girl what amazing parents, this is watch is amazingggg!